Yesterday was supposed to be uneventful and routine. All I had planned on doing was my daily writing, working maybe 3 hours at Jimmy John’s, cleaning some stuff up at the RISE House, having dinner and maybe a nap, going to sunset prayer, and watching a Disney movie or two with my friend Matt. My day was going to be busy, but it was busy with stuff I had planned. I didn’t expect anything to throw a wrench into all of this. You know what I didn’t plan on? Getting a kitten. 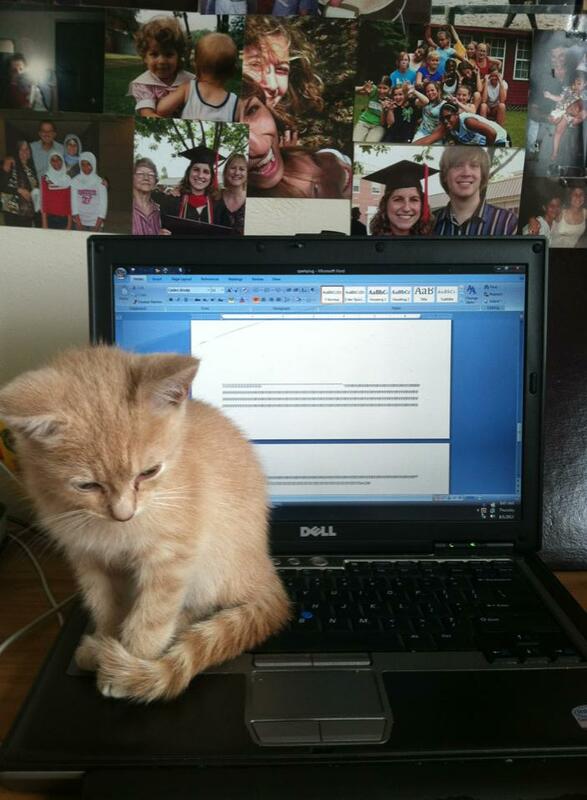 But as I write this, a tiny orange furball is walking across my keyboard, begging to be heard and demanding my attention. When he’s not exploring my room or bathroom, he’s curled up on my lap or climbing my arms, stomach, and shoulders. When he’s being really sweet, he gets close to my face to nuzzle it in love and thanks. Every time he wanders under my bed, I have a mild panic attack. And I have already emptied my savings account to get supplies and arrange a vet visit for this little one I’ve only known for 24 hours. I’ve named him Sparkplug. His name has everything to do with the circumstances that brought us together. What a wonderful start to my day. I couldn’t head to work without my apartment manager fishing a kitten out of my engine, lest I start the car and barbeque it. About half an hour before I planned to head to work, my apartment manager Evan and I went to my car to see if this little kitten was still hiding in my engine, because I did not want a fried abandoned kitten to weight on my conscience. I popped the hood. Evan lifted the hood. And there, curled up right over my battery, was Sparkplug. The little kitten that, had I not been warned of his presence, would have been very “sparky” indeed. He was so scared, so trembly, so adorable. I was half in love with him by the time I went to work. That two-hour shift at Jimmy John’s took forever to be over. And to be entirely honest, I spent most of the shift running to the back room to text Bryce, his sister Shannon (a vet tech), and my roommates about whether or not I should invite the little one into our home. So I ran to PetsMart, and following Shannon’s advice, I bought kitten food, a cardboard kitty taxi, a toy to cuddle, and a cheap plastic food dish. I even ran back out for Dawn dish soap after my roommates found that the poor thing was crawling with fleas, and my roommate Sarah and I gave Sparky his first bath (which he did great with, by the way. He didn’t try to run or maul us alive. I’m guessing he was so itchy that the bath actually felt good). Afterwards, I wrapped him up in a couple of towels and snuggled him until his coat was dry and he finally stopped shaking with cold and anxiety. And now as I type these words, little Sparkplug is pawing and nibbling on my fingers, playing with them as they tell his story. He has almost erased this post at least twice, took a small nap on the Shift key making all my letters capitalized, and typed random letters and symbols as he strolls along the keyboard, blissfully unaware of my need for “productivity” and wanting nothing more than to have a snuggle and a scratch from his new mama. He’s been such a distraction. He’s already made me make compromises on my money and my time. He’s already made me worry to death about his own health and the health of my roommate’s cat, whom I dearly love. He’s made my skin itchy with the fleas he brought with him, and he’s making me worry about all the fleas that are probably breeding in my room and bathroom now. He’s cried when I’ve left him alone in the bathroom, and now he’s making any hope of productivity today impossible. He’s also made me take inordinate gobs of time out of my day just to hold him in my lap while he dozes off. He’s made me sit in awe as I stroke his sweet soft fur and listen to his happy purrs, content in the fact that he has a roof over his head, food in his belly, and a warm soft lap to sit on. He’s made me take the time to look for fleas that still need removed to make him more comfortable. He’s eaten food off of my fingers and crawled all over me and slept on my lap. 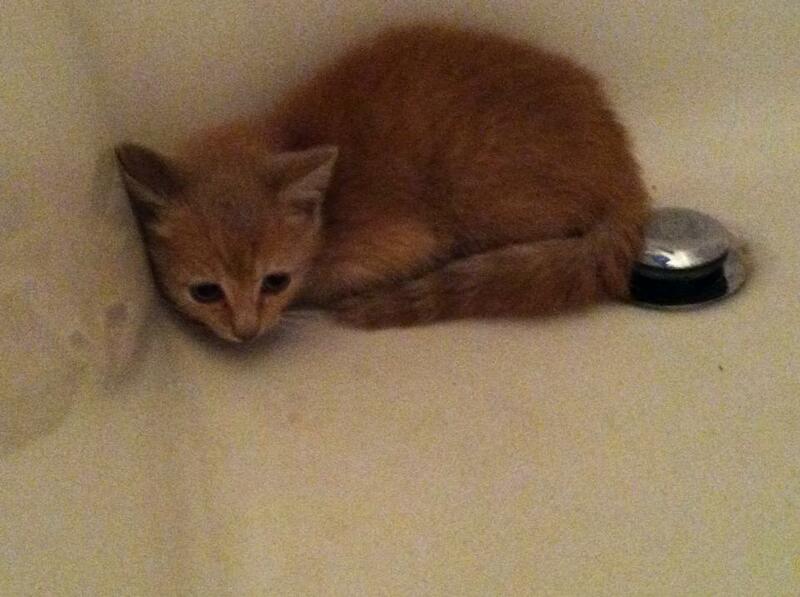 He’s even let me give him a bath to wash off the dirt and fleas that clung to his skin. He’s made me walk, talk, sit, stand, and move more slowly and softly. I didn’t expect this. I asked for it, but I didn’t think I’d actually do it. I’ve grown up with cats, but since I’ve been on my own, I’ve wanted my own little pet, a kitty I could save from a shelter that would already be fixed and dewormed and medicated against fleas. I never expected Sparkplug. And his unexpectedness has made the gift of his presence that much sweeter. Sometimes, it’s the gifts we never expected to receive, the ones we weren’t sure we wanted, that are the sweetest ones we are ever given. So even though my productivity will be at an all time low today, even though my bank account is nearly depleted and working my short shifts at work now seem agonizingly long, it’s all worth it when I come home to a snuggle from this sweet thing. Because sometimes, all it takes to make God slow me down is a little kitten curled up on my car battery. And sometimes transformation begins when God gives me the opportunity to make the slightly ludicrous decision to take in someone in need, whether or not it’s convenient, and especially when it’s inconvenient. ← God is not a man.